The Alliance of American Football becomes the first-ever football venture to never complete, at least, one full season. SAN ANTONIO — All right, so what happened? There is so much to discuss when it comes down to the demise of the Alliance of American Football league, but if there is one thing to take away, it's that the AAF's rushed operations really backfired from a financial standpoint. Co-founder Bill Polian did an amazing job putting together this football league. The teams and staffs involved should be immensely proud with what they produced in such a short period of time. Unlike other failed ventures in the past, the quality of football is not in question. I would be shocked if we don't see a slew of AAF alums in the NFL next season. While fellow co-founder Charlie Ebersol did a handful of things right – most notably investing heavily in the football and creating groundbreaking technology – he misfired with the cash and giving unilateral power to Tom Dundon. A. This was not an issue of attendance. Despite Atlanta, Salt Lake and Arizona struggling for interest, the AAF was not depending on profits from attendance to survive (though it would not have hurt). B. Reports of Dundon pilfering the technology from the AAF are seemingly false. C. There are a litany of possible lawsuits coming. Michael McCann of Sports Illustrated does a great job at laying out all of those permutations. 1. Why did the AAF suspend league operations after eight weeks? Good question! There is no denying the league was hemorrhaging money, but that was the expectation, at least during the league's formative years. Ebersol was quoted saying, "To do this for real, you can't get into this unless you're willing to spend $750 million to a billion in the first five years." When Ebersol set forth to produce a complimentary football league to the NFL, he knew it would be, at least, a three-year plan. The three-year plan involved losing a lot of money early to hopefully sustain legitimacy later and reach a partnership with the NFL. After just eight weeks of action, that goal of legitimacy was somewhat accomplished. The only problem was Ebersol did not have nearly as much money in the bank as he was telling everyone. AAF "control owner" and Chairman Tom Dundon intimated such facts when pledging his $250 million investment in mid-February. “There’s a difference between commitments and funding. They had the commitments to last a long time, but maybe not the money in the bank. My money is in my bank. I’m sure of it," Dundon said on 99.9 The Fan in Raleigh. Ebersol always needed a major piggy bank. Or maybe he was trying to zoom through his original fundraising plans. In an interview with KENS 5 in January, Ebersol mentioned a "consortium of investors," but the consortium is bogus if everyone is pledging money and no one is putting forth all the dollars they promised. It's like the stock market: If everyone is afraid to put money in, panic ensues and the market crashes. Ebersol was hoping to run this operation like a tech company. Usually, the startup collects money in increments, but if you don't hit your benchmark during one of the phases, you're in big-time trouble. Did Ebersol completely underestimate how much money he would need in each phase? Originally, as reported by Darren Rovell of the Action Network, Reggie Fowler was supposed to be the AAF's deep pockets. During week two of the season, the AAF was reportedly in trouble making payroll. The league said the payroll issue was because they switched companies, but it was later discovered Fowler had only ponied up $28 million of his $170 million commitment. That's when Dundon came in with his $250 million pledge. It is very possible the league was telling the truth regarding the coincidence of it all, but in hindsight, it's hard not to be skeptical. Long story short: Either Ebersol needed money desperately or Ebersol was worried about his original incremental fundraising plan and decided to snag Dundon who would make those efforts, seemingly, go away. He not only pledged his $250 million, but received unilateral control of the league. Ebersol and Polian forfeited their power. It was a Hail Mary move. They had to trust Dundon. They really didn't have another choice. But in the end, it seems like Dundon was not fully committed to the league. He was investing in the AAF on a week-to-week basis. When the bills started to pile up and the headaches continued, the league was done-in by Dundon. It is just a shame because, as he told CBS sports reporter Ben Kercheval, he had the dough to keep things going as long as he wanted. "One thing on the $250 million—that's enough to run this league for a long time. What it takes to invest and build, that will get us through for many years. Someone was mentioning to me earlier, they thought I had to go and pay $250 million because they'd spent it," he said. "They have not spent that kind of money. And we're good for many years to come with what I just did." A single-entity league has a lot of benefits, but this might have been its biggest downfall. In the NFL, if one owner crashes and burns, you replace him. There's a sturdy structure in place. For the AAF, the league and its teams solely relied on Dundon. If he wants out, boom. It's over. The unanswered question is: What changed? Why did Dundon just quit? All it took was six weeks for him to flail his hands in the air and give up? He knew this was a startup. He knew a lot of money would have to be spent before cashing in. Were the finances so extraordinary it far exceeded the $250 million? There is still something that does not make sense there. According to Pro Football Talk’s Mike Florio, the league needed $20 million to get through the end of the season. According to Rovell, Dundon already spent $70 million. Was it not worth it to pony up $20 million over the next four weeks to give yourself six months to reorganize and figure out an exit strategy if he indeed did not want to run a professional football league anymore? Admittedly, $90 million in 10 weeks seems like a ton of money to spend, and it's probably why Bill Polian said this on ESPN Wednesday: "(The AAF) didn't have the infrastructure to support the business side and that allowed the costs to get out of control." For one season of action, the AAF needed a little north of $35 million for player salaries. Factor in coaches, executives and staff--let's tack on another $15-20 million. Once again, Dundon spent $70 million in six weeks. Yikes. In an effort to beat the XFL on the field, the league succeeded with its football gameplan, but the financial side of things were an absolute mess. In theory, it should have been fine from everything Ebersol told us, but in reality, it looks like he was just praying things would work out until 2021. 2. Why was this a three-year plan? Why is 2021 significant? The reason this was a three-year plan is because the NFL and NFL Players Association will negotiate a new collective bargaining agreement (CBA) in 2021. As it stands now, the NFL wanted to work with the AAF, but since this league did not exist during their last agreement, the NFL could not just jump on board and fully embrace the Alliance. "The players' union is founded on the belief that using active NFL players and practice squad members for the AAF would violate the terms of the CBA and the restrictions that prevent teams from holding mandatory workouts and practices throughout the offseason. The limitations set in place are designed to ensure the safety and adequate rest and recovery time for football players. But there's a concern that teams would abuse their power and perhaps force young players into AAF action as a condition for consideration for NFL roster spots in the fall." This makes sense. These players cannot take the field 12 months out of the year. They need an offseason. Also, the NFL could use the AAF as a dangling carrot for roster spots, which is unfair to the current NFL players. Negotiations were ongoing, but it was complicated with the current CBA. Dundon said he would have to dissolve the league if the NFLPA would not cooperate with the AAF, but as Pro Football Talk mentions, this was most likely an excuse for Dundon to run away. The Alliance of American Football always hinged on the hope the NFL would invest in its league. Down the road, it probably would have, but nothing is guaranteed. If Tom Dundon was optimistic this union would work and a big payday were coming, you'd figure he would stay in, right? Ebersol's three-year plan needed so much more money. As mentioned before, he completely missed the mark here. Ugh. San Antonio continues to be the bridesmaid and never the bride. So much credit goes to the City of San Antonio. The worst-attended game was Sunday, March 28 with more than 23,000 fans. That ranks fourth in league history behind the other three games in the Alamodome, hovering around 30,000-plus fans. 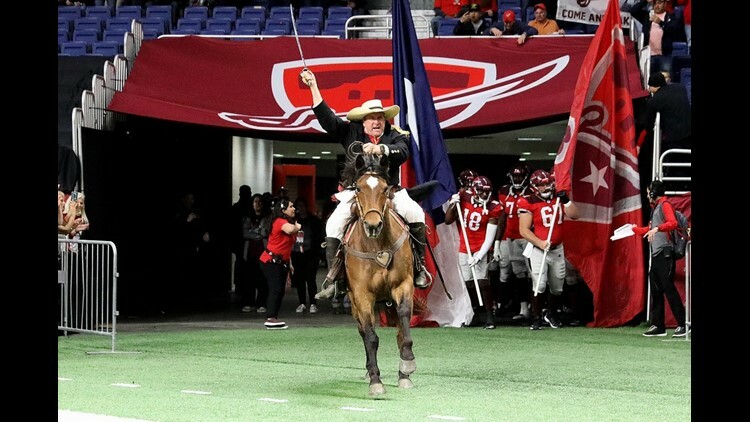 The Alamo City continues to prove it has the ability to support a professional football team, but that's honestly not in question. It has never been in question. There are significant hurdles for San Antonio to acquire a NFL franchise and it has nothing to do with Cowboys owner Jerry Jones. First of all, the city needs a state-of-the-art stadium. What benefactor is going to come in and build that? Where will that stadium go? Will the benefactor ask for public funds to pay for the stadium? Would the taxpayers be OK with that? Second, San Antonio just doesn't pack a big punch when it comes to corporate sponsorship. HEB, Valero and USAA can only do so much. Also, Spurs Sports and Entertainment would 100 percent have to be on board for such a venture. There is no easy solution here. San Antonio deserves a professional football team, but who knows if the NFL is a viable option. All I can say is this area continues to prove it would go nuts for a team. Not only have we not heard from Ebersol nor Dundon, but players are in the water without a paddle. Reports emerged Tuesday that the majority of people associated with the league had to pay for their own flights home. Medical expenses will only last until the end of the month. When this thing came to a stop, it came to a screeching halt. On the positive side, the AAF did release a tweet saying all players were allowed to engage with NFL teams. Originally, AAF players could not leave their franchises until the season was over. The NFL, fearful of possible litigation, sent a memo out to teams urging owners to not engage with AAF players, but since the Alliance essentially released everyone, that is not an issue. We actually have our first signing. We also have our first San Antonio Commander off the board as De'Vante Bausby is heading to Denver. At the top of this article, there's a link to the possible litigation options in the wake of the AAF's demise. 5. Is the Alliance of American Football league over? For now? Yes. Forever? Probably. The AAF has suspended all football operations. It is the first football league to never complete one season of play. That's pretty wild considering what other lackluster products have existed. In a more optimistic outlook, the league has not folded. There is still hope Ebersol and company can gather up new investors and prove they have a sustainable product with a head-start on the XFL. A lot of the dirty work is done surrounding the AAF; they just need someone to buy (literally) into the long-term vision. The only problem here is the league has to start from scratch. Pretty much everyone associated with the league has been fired. You need to convince coaches and players to jump back on the ship. Can anyone trust Ebersol and company after such a failed first run? Furthermore, the XFL is returning in 2020 with Vince McMahon leading the charge. The biggest difference between Ebersol and McMahon, besides business acumen, is McMahon can actually fund the league himself. McMahon's patience is going to pay off because he learned from Ebersol's monetary mistake. McMahon has $400 million in the bank ready to go. McMahon is properly prepared for the hardships coming. Maybe Dundon realized McMahon was building an artillery of dollars and Dundon was in way over his head? The XFL is now in prime position for the new CBA in 2021 and maybe, just maybe, McMahon will expand from eight teams in the future and head to San Antonio. Even if they don't expand, move a franchise to the Alamo City. The XFL has teams in Dallas, Houston, Los Angeles, New York, St. Louis, Seattle, Tampa Bay and Washington D.C. All but one of these cities has a NFL team. With the AAF out of the way, a San Antonio squad seems like a viable option down the road.